Women’s football is gaining more attention from the media with the success of the Lionesses (England Women’s National Ream) as it is just as technical and enjoyable as the men’s game. It is an exciting area of growth within the world of sport, no more personified than the recent multi-million pound sponsorship deals with Boots, Barclays and Budweiser. It’s only going to get more exciting globally this summer with the FIFA Women’s World Cup being hosted in France. Locally the Peterborough United (POSH) Ladies First Team are an up-and-coming side that currently play in the East Midlands Women’s Regional Premier which is the equivalent of one below the football league in the men’s game. The team have high aspirations of being promoted and a football league side within their 10 year operation plan, which they are now into their fourth year. To achieve this it was decided by the staff at the club to try and give the players the best environment to thrive and reach their full potential. The club acknowledged that they required assistance in other areas of sports performance such as performance psychology, motivational climates, coaching philosophies, strength and conditioning. 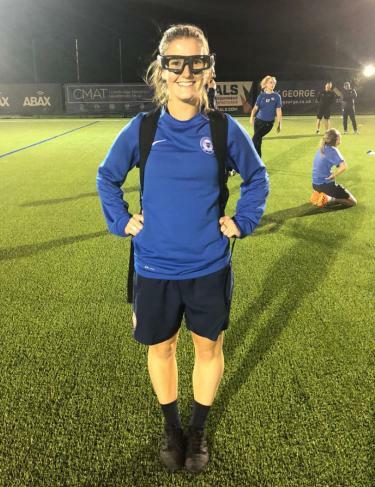 In August 2018, the BSc (Hons) Sport and Exercise Science department at University Centre Peterborough (UCP) were asked for academic staff and students to provide assistance with the Ladies First Team. The UCP sports department has already worked with both male and female scholarship players at Peterborough United FC. This season, both players and coaches have been set the challenge of being the best that they can be with the ultimate goal of becoming self-regulating. On the first ever session delivered the ladies were presented with a sprint technique session in which none had ever encountered. The ladies were encouraged to assess their own running technique and incorporate new key elements. The focus of this session however was not simply to work on sprint technique, it was to also assess their resilience, team spirit and motivation as it was a purposefully difficult session. Sessions continue in this trend and but have predominantly orientated around contextual performance psychology where players have been challenged to solve ‘problems’ in order to enhance their decision making skills. Improving decision making in football is not the easy task it sounds and is ultimately an undulating process. Players have been presented with multiple small sided game scenarios in which they are challenged to identify relevant and irrelevant stimuli in order to make the correct decision at that time. During these sessions a key factor is that it is ok to make mistakes and they won’t be berated for them. What is expected however is that they analyse them, understand them and move forward to the next decision. With this in mind players have also been introduced to eye tracking technology in which we are have been able to assess precisely what their areas of interest and fixations are in given scenarios. In doing this it has highlighted to both players and coaches the importance of search behaviour / patterns and has been a key development as the season has progressed. In order to make effective decisions as a coach in terms of training intensities etc. they need information. This information has been supplied by the ladies wearing Catapult GPS Trackers for a number of games and they track the distances they run, the intensity in which they work and where they are on the pitch. In knowing this data player’s risk of injury / burnout can be assessed and enables coaches to make informed decisions on session planning. Not all activities have been practical as multiple education sessions have been conducted. These sessions have predominantly orientated around team identity and what it means to be a Peterborough United Ladies First Team Player. The players have contributed to what is being entitled the ‘Blue Book’ where all personnel essentially sign a ‘playing contract’ and agree to abide by the values of the team outlined within it. Other educational sessions have orientated around motivational climates and ultimately have challenged the players and coaches to not be so outcome orientated. Players have progressively been set the task of breaking scenarios down into processes, analyse them and trust them as they apply them in the practical sessions. This first season with the team has been a pleasure and essentially a voyage of discovery for all parties. It has been a privilege for the UCP sport department to work with such open minded players and coaches who have a solution oriented mentality. In terms of processes the ladies have openly admitted they feel better players in regards to their mental game and also understanding how to break down their performances more effectively so they can further enhance them. 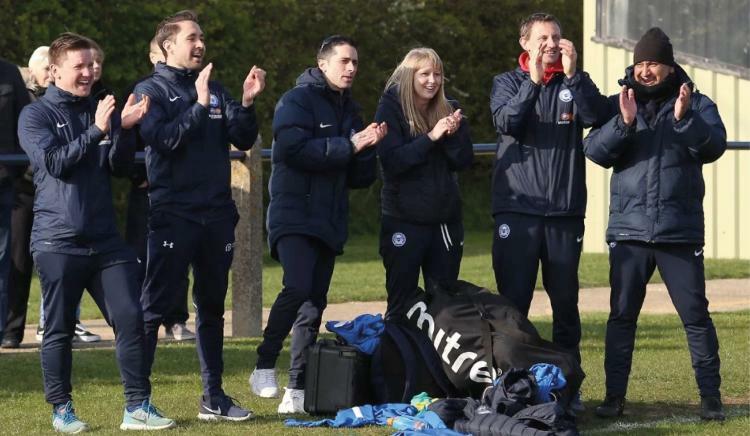 It is looking like they will finish second in the league to Leicester City Development Ladies, which should be considered a significant achievement considering most teams in the league have been established for over a decade in comparison to the four years of Peterborough United. 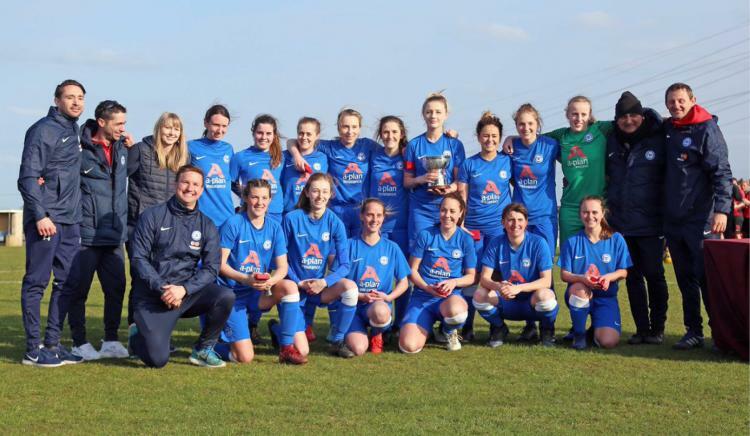 Most recently Peterborough United Ladies First Team won the County Cup for the first time and it is likely that this will be the start of many things to come with this young exciting team.